We're doing the Mommy school today because tomorrow will be a Feature Friday with my mom's new pattern. I'm excited to show it to you. 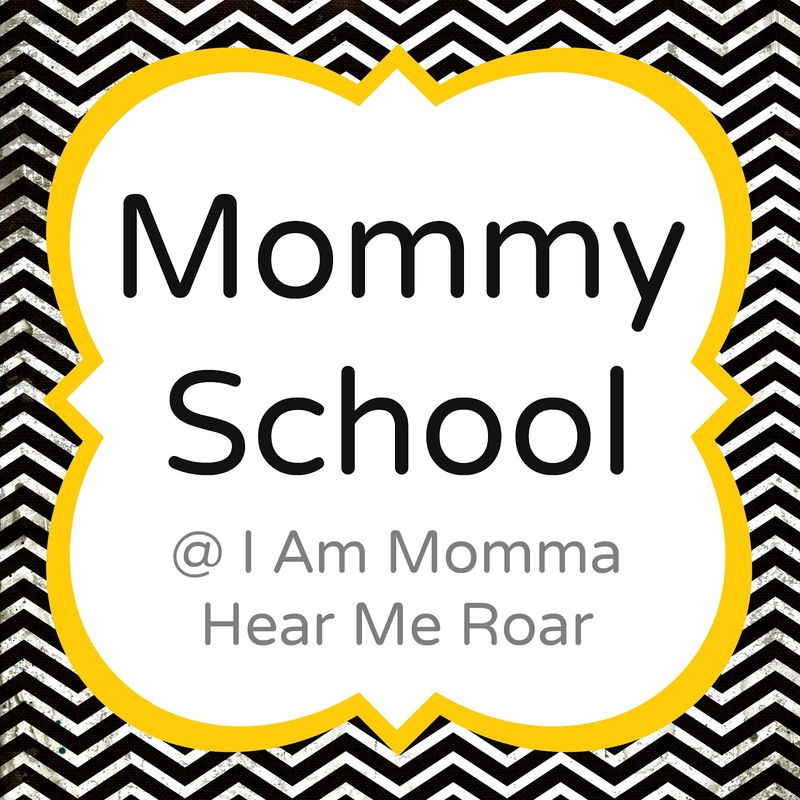 Anyhow, here's three of our hits from Mommy School this week. 1) Colored Water Travel. This experiment was super fun. I found it HERE. We took three glasses and filled two with water. The boys added blue food coloring to one and yellow to the other. Then we placed two paper towels (still connected) into the glasses like shown, with the empty glass in the middle. The water begins traveling up the paper towels. In about thirty minutes you see this. The water begins to accumulate in the middle glass, making green water. After an hour or two you see this and another hour later all three cups were evenly filled. Both the boys and I were pretty excited with this experiment. We left it out so we could show it off to Mr. Roar when he got home from work. 2) Magic Milk Paint. We found this in our little science book we got in the bin at Target. However, there's a better version of it HERE at Modern Parents Messy Kids (and she found it HERE) that we ended up using the second time. You just put some milk (preferably whole) in a bowl. 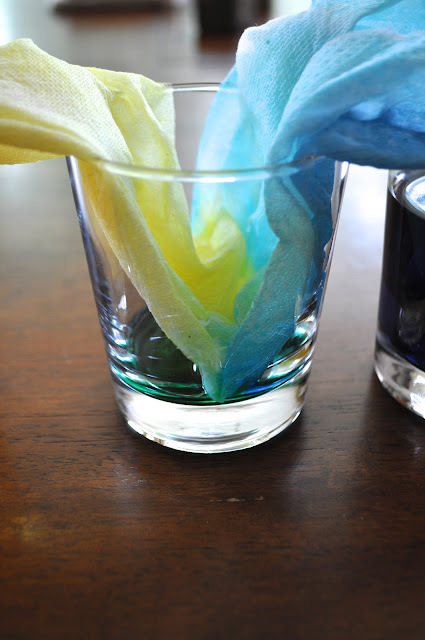 Add drops of food coloring in various places. 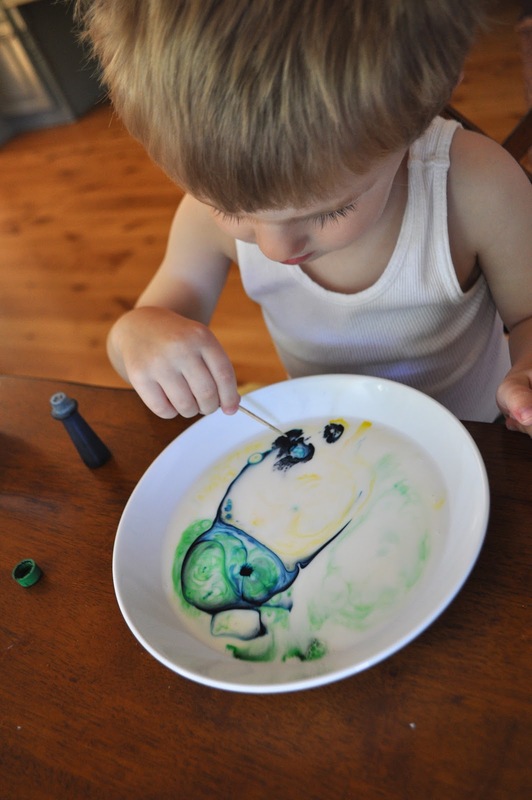 Dip a toothpick into dish soap and then dip it into the colors. The soap disturbs the surface tension and pushes the colors away. My pictures don't do it justice. The boys did lots of layers of it and then had fun swirling the toothpick around to make cool designs. 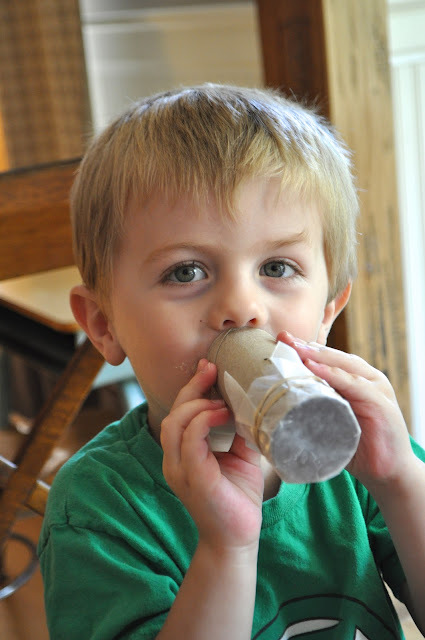 3) Homemade Kazoos. You definitely have all these supplies on hand. For instructions we went HERE. You just cover the end of a toilet paper roll with wax paper, using a rubber band to secure it. You also need to poke a small hole in the middle of the roll. Then use it like a kazoo. I probably should have invested in ear plugs before this activity, but the boys loved it. To add some additional learning, I wrote a number on a dry erase board and then had them blow their kazoos that many times. I used smaller numbers for Baden and larger numbers for Rex. It helped their number recognition, but I thought it was also good for them to have to "act out" the number and verbally show how many it was. They really enjoyed it. And that's Mommy school for this week. - Ever wanted to make your own light switch plate? I thought THIS was really cool. - Would I be totally crazy if I put fake plants in the planters by my front door? I have a gift for killing plants it seems. What's the opposite of a green thumb? A red thumb? That's what I have. 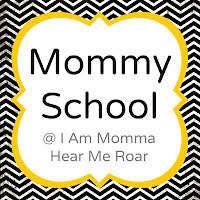 Cheri, I have SO enjoyed your Mommy School posts! They're great! The milk idea looks really cool! 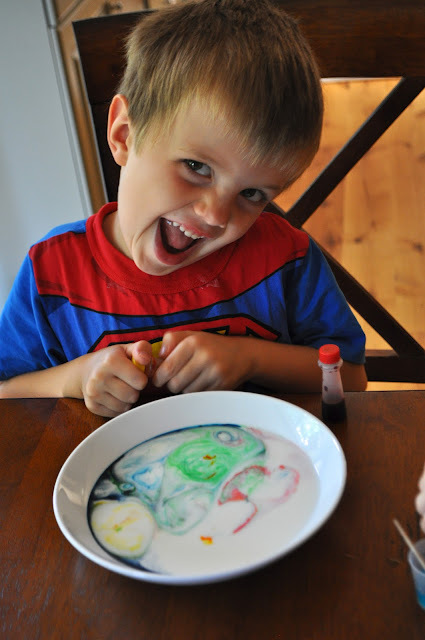 You can do a similar trick with the milk using shaving cream instead. The great thing about the shaving cream is you can then transfer the colors to make fake marbled paper. Its super cool. Mary, this is a pretty good tutorial: http://www.wikihow.com/Paint-Marbled-Paper-Using-Shaving-Cream. Its really easy and fun to do. Not crazy to put fake plants in planters unless you periodically put larger ones in the planters to make it look like they are growing. A lady in the town where I went to college did this with little Christmas trees and I was very creeped out by it! Love, love, love the new blog design!!!! ok, now I'll go back and read the post. The opposite of a green thumb is a black one. I know this, because I have one, too. Your school ideas look super fun! Haha! I think it's called a black thumb ;) And there are some fake plants that look very "real". I say give it a try! My boys are going to love the homemade kazoos, thanks for the fun ideas! I love these! I am totally doing them tomorrow with my little man and my teenagers! What fun! Absolutely go with fake plants. I cannot keep a plant alive to save my life! What is the level of sun/shade/ability to water? How large and how many planters? Then, if you decide to get away from flowers what about making some art for the space? Found objects or paintings or a neat new house number (again, depending on the available space). Thanks for the links, Handri! I love them and I think I really will go with one of those options. Thank you so much! I did the same thing (and for the same reason) in the two planters by my front door. I got 2 pyramid-shaped trellis', 2 grapevines (purchased swirled up in a coil from the craft store), and some fake greenery (fern-looking stuff). Put it all together and viola! I will also occassionaly switch the greenery part out for holiday decor--red, white and blue stuff for Memorial Day thru 4th of July, fall items, spring flowers, etc. The trellis' add important height and structure. I love mine and hope you do, too! Three cheers for no watering cans! !